Terrestrial Gamma-ray Flashes, More Common Than Previously Thought? Dec 31, 2014: Each day, thunderstorms around the world produce about a thousand quick bursts of gamma rays, some of the highest-energy light naturally found on Earth. By merging records of events seen by NASA's Fermi Gamma-ray Space Telescope with data from ground-based radar and lightning detectors, scientists have completed the most detailed analysis to date of the types of thunderstorms involved. "Remarkably, we have found that any thunderstorm can produce gamma rays, even those that appear to be so weak a meteorologist wouldn't look twice at them," said Themis Chronis, who led the research at the University of Alabama in Huntsville (UAH). The outbursts, called terrestrial gamma-ray flashes (TGFs), were discovered in 1992 by NASA's Compton Gamma-Ray Observatory, which operated until 2000. TGFs occur unpredictably and fleetingly, with durations less than a thousandth of a second, and remain poorly understood. In late 2012, Fermi scientists employed new techniques that effectively upgraded the satellite's Gamma-ray Burst Monitor (GBM), making it 10 times more sensitive to TGFs and allowing it to record weak events that were overlooked before. "As a result of our enhanced discovery rate, we were able to show that most TGFs also generate strong bursts of radio waves like those produced by lightning," said Michael Briggs, assistant director of the Center for Space Plasma and Aeronomic Research at UAH and a member of the GBM team. Previously, TGF positions could be roughly estimated based on Fermi's location at the time of the event. The GBM can detect flashes within about 500 miles (800 kilometers), but this is too imprecise to definitively associate a TGF with a specific storm. Ground-based lightning networks use radio data to pin down strike locations. The discovery of similar signals from TGFs meant that scientists could use the networks to determine which storms produce gamma-ray flashes, opening the door to a deeper understanding of the meteorology powering these extreme events. Chronis, Briggs and their colleagues sifted through 2,279 TGFs detected by Fermi's GBM to derive a sample of nearly 900 events accurately located by the Total Lightning Network operated by Earth Networks in Germantown, Maryland, and the World Wide Lightning Location Network, a research collaboration run by the University of Washington in Seattle. These systems can pinpoint the location of lightning discharges -- and the corresponding signals from TGFs -- to within 6 miles (10 km) anywhere on the globe. From this group, the team identified 24 TGFs that occurred within areas covered by Next Generation Weather Radar (NEXRAD) sites in Florida, Louisiana, Texas, Puerto Rico and Guam. For eight of these storms, the researchers obtained additional information about atmospheric conditions through sensor data collected by the Department of Atmospheric Science at the University of Wyoming in Laramie. "All told, this study is our best look yet at TGF-producing storms, and it shows convincingly that storm intensity is not the key," said Chronis, who will present the findings Wed., Dec. 17, in an invited talk at the American Geophysical Union meeting in San Francisco. A paper describing the research has been submitted to the Bulletin of the American Meteorological Society. 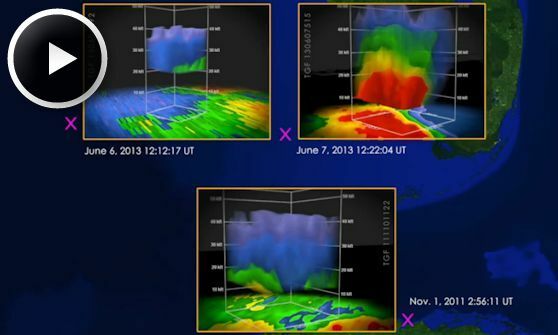 Scientists suspect that TGFs arise from strong electric fields near the tops of thunderstorms. Updrafts and downdrafts within the storms force rain, snow and ice to collide and acquire electrical charge. Usually, positive charge accumulates in the upper part of the storm and negative charge accumulates below. When the storm's electrical field becomes so strong it breaks down the insulating properties of air, a lightning discharge occurs. Under the right conditions, the upper part of an intracloud lightning bolt disrupts the storm's electric field in such a way that an avalanche of electrons surges upward at high speed. When these fast-moving electrons are deflected by air molecules, they emit gamma rays and create a TGF. About 75 percent of lightning stays within the storm, and about 2,000 of these intracloud discharges occur for each TGF Fermi detects. The new study confirms previous findings indicating that TGFs tend to occur near the highest parts of a thunderstorm, between about 7 and 9 miles (11 to 14 kilometers) high. "We suspect this isn't the full story," explained Briggs. "Lightning often occurs at lower altitudes and TGFs probably do too, but traveling the greater depth of air weakens the gamma rays so much the GBM can't detect them." Based on current Fermi statistics, scientists estimate that some 1,100 TGFs occur each day, but the number may be much higher if low-altitude flashes are being missed. While it is too early to draw conclusions, Chronis notes, there are a few hints that gamma-ray flashes may prefer storm areas where updrafts have weakened and the aging storm has become less organized. "Part of our ongoing research is to track these storms with NEXRAD radar to determine if we can relate TGFs to the thunderstorm life cycle," he said.